This is the Top 10 list for the month of August. In other words, the month that ended yesterday. Now, I've been podcasting for nearly a year, and I am always thrilled to see this show do well in the rankings. However, I have never seen the podcast in the #5 spot be in the #5 spot. In fact, I've never seen the 1 Year Audio Bible Podcast end up in any other position other than #1. Why is that? Come on. You know where I'm going with this. The Christian podcast has an audience that pagan podcasts just don't have. Or, perhaps, they did. Perhaps this is a sign - a small sign, granted - that pagan podcasts are finding an audience. And not just the standard audience for such shows, but a larger, growing audience. Pagans are branching out and looking to new media sources for their research. Podcasts are a great way to not only do research, but get various views on the big and small issues in paganism, Wicca, magic, and more. They also provide a semblance of community. You can tune in to a friend and spiritual adviser that breaks the big questions down into easily digestible bites. This community is becoming a centralizing force in the quest to become some form of legitimate religious and spiritual social pillar. And, yes, that might be reading a lot into a Top 10 on Podcast Alley. It might be reading a lot to say that beating out the enormous vote-getting power of the big name Christian podcasts is a sign the tide might be turning for the pagan community. We might no longer be a community of individuals who want to remain solely solitary. Just maybe we are coming together. And that starts with shows of solidarity like this. Just as a footnote, please remember to VOTE as it is a NEW MONTH! 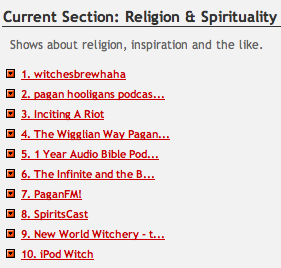 I can't help but notice that 9 of the top 10 are Pagan podcasts. It's not even that we knocked the Bible out of #1--we pretty much ARE the Top 10 list! I know how much listening to Pagan podcasts (yours included!) has helped me on my own path, so I'm not at all surprised by the listing. Being able to listen to someone else's voice brings everything to life in a way that reading a book--even the best of books--simply can't. It adds the human factor, which in turn adds to the sense of community. well there is always strength in numbers. I remember waking early once, on the first of the month, and voting on PCA for the various Pagan podcasts listed at that time, and when I refreshed the page, my own podcast "Down East Pagan" was at number one. Well, I knew it wouldn't stay there for long, as very few votes had been cast that early in the month, so I printed out the page just for a souvenir of the moment. 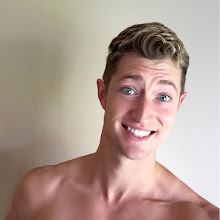 I just wish there weren't so may people on BlogTalk Radio trying to fill two hour shows with 15 minutes of material, and endless minutes of "can you hear me?" alternating with "um, er, ah ..." as well as an awesome amount of misinformation.